Minnesotans honor MLK and say yes to peace, no to NATO | Fight Back! 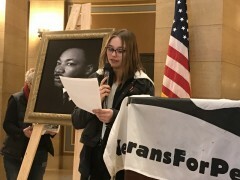 St. Paul, MN - On April 4, 80 people gathered at the Minnesota State Capitol building to honor the legacy of Dr. Martin Luther King Jr. and to use his words to analyze the militarism of the North Atlantic Treaty Organization. Both MLK and NATO are connected to the date of April 4. On April 4, 1967, Dr. King delivered his “Beyond Vietnam” anti-war speech at the Riverside Church in New York City. He would tragically be assassinated exactly one year later, on the balcony of the Lorraine Motel in Memphis, Tennessee. On April 4, 1949, the North Atlantic Treaty was signed marking the inception of the military alliance known as NATO. The program began on the capitol steps with songs by Sister Brigid McDonald, introductory words by Sue Ann Martinson and Mel Reeves, a bell ringing by Veterans for Peace, and a eulogy to Reverend King by Bishop Richard D. Howell Jr. of Shiloh Temple. Inside in the capitol rotunda the crowd heard two main presenters: University of Minnesota Professor August Nimtz on the civil rights legacy of Martin Luther King Jr., and Major (Ret.) Todd E. Pierce on NATO. Interspersed throughout the program were readings from the “I Have a Dream” and “Beyond Vietnam” speeches by local elementary and high school students. The event was sponsored by the Minnesota Peace Action Coalition, Veterans for Peace Chapter 27 and Women Against Military Madness.